Meet MatteMoiselle, a range of matte lip colors in a stunning array of hues. 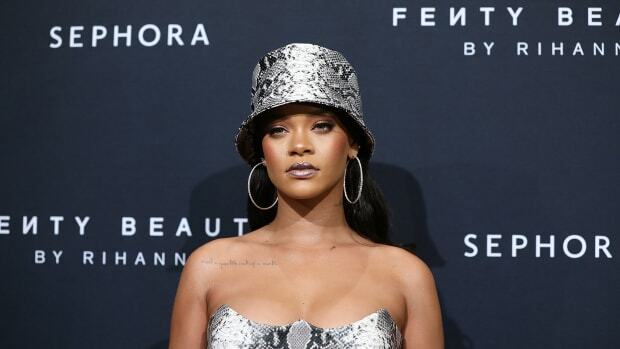 According to the caption accompanying the post, the MatteMoiselle line will contain 14 shades, ranging from nudes to reds to a bold violet, a green and even a dark navy shade pictured on Rihanna herself (above). Unlike the Fenty Beauty Stunna Lip Paint, this formula comes in solid, bullet form. It also appears to have a super-intense pigment payoff, if the images of Rihanna wearing it are any indication. A green shade can also be seen on SZA, who took a break from her super-successful singing career to model for her fellow musician, with whom she&apos;s also collaborated on music in the past. Fenty Beauty&apos;s MatteMoiselle lipsticks will be available on Sephora.com, HarveyNichols.com (as well as in stores) beginning at 9 a.m. on Dec. 26, so mark your calendars — and maybe re-think those post-holiday sleeping-in plans. This article was updated to include SZA modeling the line. Also new: A "Fairy Bomb," or a makeup pouf stuffed with highlighter that can be dusted just about anywhere. The second drop of the Beach Please collection is the stuff summer makeup dreams are made of. Calling all Fenty Beauty fans. Also on the way: brushes and an eye primer.